Travelers needn’t worry about tipping Gatwick Airport’s new parking valets. In August, the U.K. airport will begin a three-month-long pilot program in which robots codenamed “Stan” park travelers’ cars for them — and if all goes well with the trial, the bots could become a common sight in parking lots across the globe. According to a planning application submitted to the Crawley Borough Council by the Gatwick Airport, a driver will park their car in one of eight newly built cabins and summon a Stan via a nearby touchscreen before catching a shuttle to the airport terminal. A Stan will roll to the front of the car and lift the vehicle up, similarly to how a forklift lifts a pallet. The bot will then ferry the car to one of 270 available parking spaces. The robot valet service knows each passenger’s flight info and will retrieve their car when they return to the Gatwick Airport, placing it in one of the cabins for pick-up. When a person parks a car, they need to leave enough room to open their doors and exit the vehicle. But because the cars a Stan parks are empty, it can place the vehicles closer to the surrounding cars. If all goes well during the three-month trial, the Gatwick airport pilot program could lead to a more widespread implementation of the technology that would allow it to replace 6,000 available self-parking spots with 8,500 spots maintained by robot valets, all without increasing the size of its parking lots. 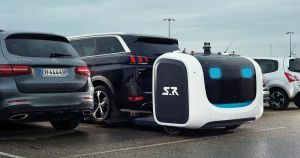 And the space-saving tech could make the robots an attractive option anywhere parking is at a premium, not just airports — it’s not hard to imagine a future in which robot valets swoop in to park cars at stadiums, amusement parks, and shopping centers across the globe.